We at MiaDeRoca love Christmas and we think it (hardly) can't start early enough. Okay, in August we don't fancy gingerbread very much and sometimes we think it is a pity, that in our area we don't celebrate Halloween or Thanks Giving. Because as soon as summer is ending all the Christmas stuff is entering shop windows and shop shelves. Privately and concerning our on-line store we like to be prepared early for the Christmas season and so it starts in October that blinking and glittering things are entering the living room, the number of candles increase, and joint crochet, knitting and crafting sessions are more frequent. Christmas at MiaDeRoca starts before December first and this year the first advent Sunday starts November 28th. On December 4th is the remembrance day of Saint Barbara, "Barbara twigs" are cut and put into a vase. In our family we used twigs of cherry trees or forsythias. Other people use twigs of apple trees, birch trees, hazelnut bushes, chestnut trees, plum trees or elderberry shrubs. Until Christmas Eve there are blossoms on the twigs. In former times these little flowers where the only flowers found in homes during the cold months of winter. Some use their Barbara twigs as oracle: if the twigs blossom until Christmas, it will be a lucky new year. Through adding warm water and placing the vase close to the radiator you can positively influence your fortune. The next day, the fifth of December is already the 2nd Advent Sunday. On the 6th of December we celebrate St. Nikolaus. In Austria St. Nikolaus brings sweets, nuts, tangerines, toys and smaller gifts for the kids. And if there is a St. Nikolaus, the so called "Krampus" is not far away, around the 6th of December these fury creatures, with frightening masks, rustling chains, cow bells and twigs as rod can be seen in several places in Austria and the south of Germany. The rest of the Advent Sundays are celebrated as well and each of them brings you closer to the big day, the 24th of December. In Austria Christmas is celebrated at the 24th in the late afternoon or the evening the "Christkind" (christ child) brings the adorned Christmas tree and the parcels to every house. After Christmas we love to do a walk in the snow – if it is real high we have to make several snow angels (lay down in the snow and move arms and legs). And one or several times we have to go tobogganing (or sledging), and if there is not enough snow we will bake some yummy winter sport cookies and eat cookies shaped as skiers, sledges and ice skates. On the 31st we celebrate the end of the year and we are looking forward to what the next year will bring – 2011 that sounds all new and unfamiliar, there are many possibilities to fill this year with lots of good things. 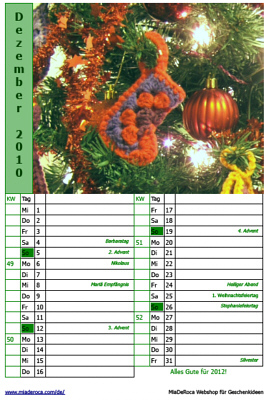 Download the MiaDeRoca calendar sheet for December 2010, on the one sided calendar page you will find week days and calendar weeks. We wish you a great december with lots of time and joy with your loved ones and the things you enjoy.